Account-based marketing (ABM), also known as key-account targeting, is a strategic marketing approach, that treats an account (which may be at an individual, company, vertical or cluster level) as a market of one. ABM is highly personalised, and combines insight-driven marketing with sales, to increase awareness, develop relationships and drive growth within specific high-value, high-propensity accounts. ABM 'flips the funnel' to treat each customer as a market of one, rather than targeting a wider persona demographic, as inbound and other, traditional lead gen strategies do. Often described as 'fishing with spears' rather than 'fishing with nets' depending on your ABM starting point, a campaign will begin with a selection of target company accounts (or industry verticals), then work to expand relationships and buy-in with key stakeholders and decision makers within that account or industry. With the potential to drive stronger, more valuable customer relationships and enhance retention, Account-Based Marketing is an increasingly valuable strategy for B2B marketers. Note that there are different levels of ABM, which we outline in the section below. Different marketers will have different starting points on the road from inbound to ABM. For example, some will start by targeting to specific individuals (ABM 1 to 1), whereas others will need to start by targeting an account list within a vertical (ABM Lite), or may only have an initial list of good-fit accounts at a persona level (Inbound to ABM). Each ABM campaign must be tailored to suit uniquely. Working to move perspectives of your business from 'just a vendor' to 'a trusted partner', ABM uses strong account insights in order to make marketing more personalised, engaging and relevant, often at an individual level. What should an account-based marketing plan actually look like? The route any specific account-based marketing campaign follows will depend on a number of factors and components - which will all change uniquely for the campaign at hand, and will be influenced by an organisation's initial level of ABM maturity. So to define what your account-based marketing plan should look like, where to begin and what activities to expect, it's important to first understand your organisation's ABM starting point. 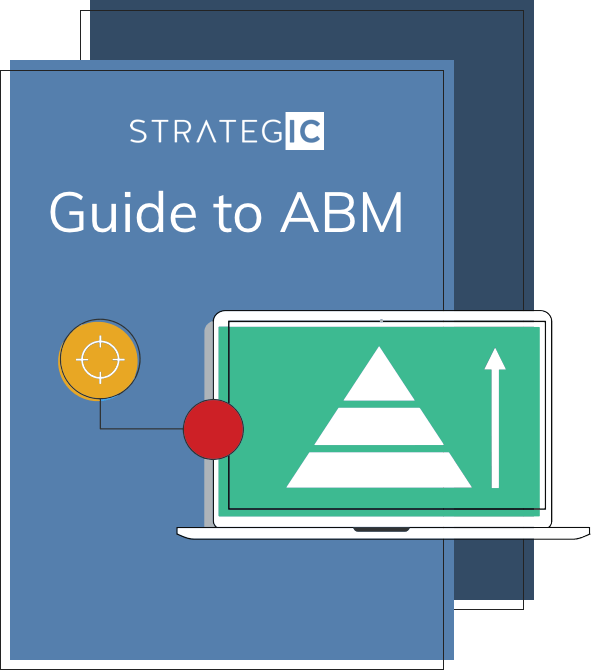 At Strategic, we have defined four-tiers of ABM to outline the different starting points that an organisation may need. This framework covers a range of ABM maturities, from those who lack in depth account insight and are simply conducting inbound marketing (or another 'traditional' lead gen approach), to those moving from inbound to ABM activity, to those with a clearer perspective of the high-value, high-propensity accounts that their campaign needs to target. The top of the framework outlines an ABM 1 to 1 approach; which selects specific individual contacts and accounts who are highly engaged/ with high propensity to buy. Organisations who suit this tier already have insights at an account and contact level, so the campaign itself will highlight value by addressing the specific account/individual's challenges in specifically personalised content. The further down the framework we move, the broader the targeting focus and starting point. At an ABM Lite level, activities are still quite personalised; organisations who suit this tier will target using a defined account list and vertical focus - but may not yet have clarity on specific target individuals. The content and messaging in an ABM Lite campaign will address challenges at a vertical or industry level, but also incorporate specific account business drivers where possible. An Inbound to ABM campaign is almost a transitional stage, where inbound activity works to generate relevant leads and creates a nurture pool of opportunities, from which to identify high-value, high propensity accounts for ABM Lite, or ABM 1 to 1 activity. At the Inbound to ABM stage, campaigns will target at a persona challenge level, with the potential to personalise further as good-fit accounts are identified. At the inbound level, campaigns market to unknown accounts via organic and paid channels, without any specific account filter. Campaign content and messaging is again targeted at a persona level, using any existing customer data to inform content and messaging. So, do you need a clearly defined list of target accounts are in order to begin ABM? No; it simply means that your ABM plan will need to start on one of the lower maturity tiers and gather the insight needed to expand into more account-targeted activity. Activity execution in an ABM campaign will vary depending on your overall campaign success criteria, campaign goals, targeting criteria, best-fit channels for your account focus - and of course your ABM maturity. With so many moving parts, Account-Based marketing can be complex to execute successfully. Simply understanding what activities comprise an effective campaign isn't always enough. To really see success and avoid campaign errors, it's important to follow a number of account-based marketing best practice protocols. What goals and KPIs should you set for an account-based marketing campaign? They may differ to the metrics you'd expect in a more traditional marketing strategy. For example, in other strategies, you may monitor progress by reviewing pageviews, engagement, clickthrough etc, top level KPIs etc. But for account-based marketing, measurement usually come down to quality account generation, account DMU contact increase and revenue expansion within accounts. To succeed with ABM, you need to ensure campaigns are focussed towards securing quality account relationships, and that you are closely monitoring how effectively your team progresses with, and converts those ABM relationships - to see results. It's also crucial that your campaign sets clear success criteria. What will success look like for your campaign; quality engagement, awareness with X key accounts or otherwise? Make sure these criteria and other goals align with the overall objectives of the business. Not every organisation will be ready to jump into ABM with a clear idea of who their high propensity accounts are, or know who the individual decision makers within those accounts are. If you're considering an ABM campaign, running a pilot is an ideal way to showcase potential results, build support internally, and develop the initial foundation and resources required for a full ABM programme. A pilot is crucial to test how ABM may work for you at a resources/results level. However, if you are a marketer charged with evaluating ABM as a go-to-market strategy in conjunction with traditional demand gen, you shouldn't say yes to a campaign unless you can first secure internal buy-in. A pilot is a great way to do this and manage those internal expectations. Securing the support of sales teams - as well as other executive buy-in is crucial for ABM; your organisation must be able to commit to supporting the campaign at every stage of the customer lifecycle, and must be willing to allow realistic timescales and objectives if a pilot (or later on, a full blown ABM campaign) is to gain traction. In line with managing expectations, when planning and implementing an ABM campaign, make sure everyone involved has a clear idea of their unique ABM role and responsibilities. Your sales and marketing teams need to have an aligned perspective on the goals of the campaign, on what content is being created, what promotional and follow up activities are being executed, and much more in order to ensure combined effort and progress in the right direction. To keep track, hold regular sales/marketing catch-ups to review tasks, monitor how accounts are progressing and brainstorm new ideas. As it's unlikely that your teams will win every account targeted, it's wise to use these meetings to review and learn from any lost deals. It's the best way for all sides to learn, stay aligned and progress your ABM approach. Account-based marketing is a transformative strategy for both marketing and sales. Increasingly, marketers are expected to be able to define, execute, report on and succeed with campaigns that precisely target and appeal to the best-fit, high yield prospects for your solution. ABM allows marketers to achieve lead goals by creating a more targeted, joint sales and marketing plan that treats high-value accounts as “markets of one” comprised of multiple key stakeholders. But understanding how to develop and action a successful ABM strategy can be complex; even if you already have an understanding of your ABM maturity level and common ABM best practices, each campaign will be different. There's a lot to consider! So what account-based marketing tactics should a campaign use, and what execution channels are best to use for different ABM programmes? ABM centres all activity around precise key customer accounts (or verticals/ clusters). Unlike traditional lead gen focussed strategies, which focus on lead volume, the goal with ABM is to progress awareness and relationships with decision makers in your target accounts. 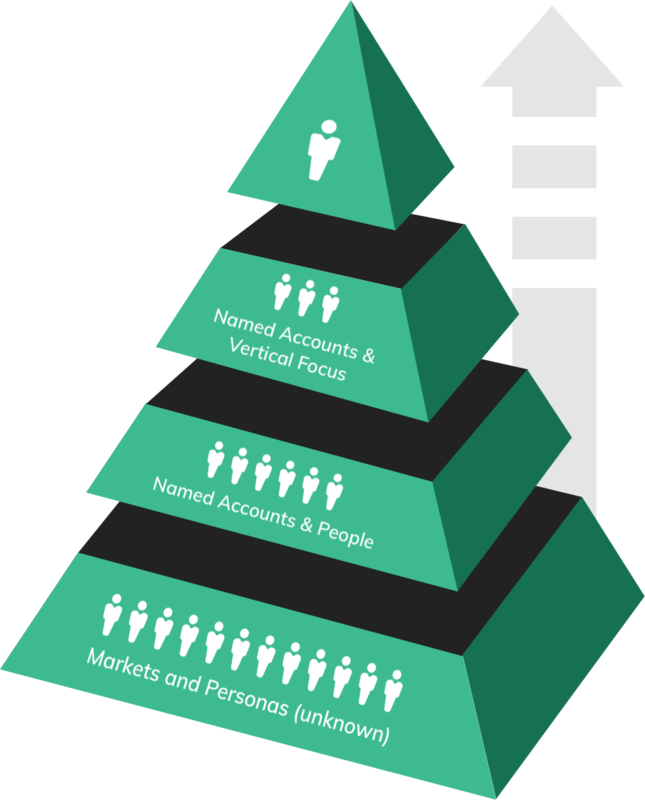 So to run a successful campaign, you must first have a clearly defined view of your target accounts (dependent on your ABM targeting criteria; accounts, verticals, clusters etc), their attributes (ideal revenue, size, location etc) and their key challenges (at the appropriate account, cluster or vertical level) that your solution addresses. Once you have a clear view of the attributes you're looking for, you can create a shortlist of good-fit targets who fit those parameters, and use them to qualify any current database contacts you already have. Ideally, when you know which accounts you want to target, your campaign should work to identify the best contacts within those accounts to connect with - those decision makers and stakeholders who make up the Decision-Making Unit (DMU), and work to raise awareness/engagement with them. A strong foundation of data-driven insight is integral to the success of any marketing campaign. Account-based marketing is no different; data insight must be used to develop bespoke propositions and messaging for each customer and stakeholder group. Put simply, data insight is integral to steer your campaign. Use your own customer/campaign data, account level data from social listening and even 3rd party intent data to identify accounts with the highest propensity to buy. This insight will also highlight where you should focus sales and marketing effort, and how to tailor campaign messaging for the best return. Increasing leads, improving retention and driving revenue are increasingly, a marketing goal. This means sales and marketing integration must be more cooperative, clear and comprehensive than either team may be used to. Today, instead of marketing working to generate leads before handing them off to sales, both teams must align on campaign goals and activities as a whole, to ensure seamless support and campaign decisions through every stage of a prospect's journey. In any ABM campaign, both sides of the business must have clarity on precise account focus, campaign goals, responsibilities and more - and feedback frequently - if campaigns are to run successfully. Before any activity can be considered, you need to have the right infrastructure in place to support your campaign. For seamless execution, campaigns will use a CRM, Marketing Automation platform, CMS, ABM content promotion tools, and social promotion channels - all of which should integrate for best tracking and reporting. ABM is about highly personalised, targeted marketing, that resonates with a specific account's challenges. So if you're not creating messaging and content that reflects that, you're not making the most of your strategy. Once you have appropriate insight into your target accounts, consider the individual, company or vertical challenges (dependent on your programme) they have, that you help to address, and develop messaging accordingly. From targeted, segmented email marketing, through social selling, to on-page content personalisation (or 'smart content') make sure every interaction your account has with your messaging and content is relevant to them (and personalised when appropriate). As the focus with ABM is not primarily on lead volume, but on developing a relationship with a quality account, a range of other hard and soft metrics should be defined that can be mapped back to specific sales and marketing objectives. When assessing success, consider: are you effectively moving accounts to opportunities? Are you focussing on successfully developing a relationship with the DMU? Are you on track to achieve your goals and ROI? Execution channels include - For a small audience size, the same as ABM 1 to 1, channels. If targeting a large single account with large global audience size; LinkedIn Sponsored Updates, InMails, or email if existing contacts are known. Keep in mind that every campaign is unique - channel selection will also depend on the environments that your target accounts are active in; which may include offline activity. Technology has transformed the very basics of B2B marketing. Sparking the advance of Inbound marketing, digital evolution has enabled more precision targeted, cost-effective, comprehensive and scalable marketing strategies to exist. To build better ABM campaigns, target effectively and connect with key accounts and opportunities, it's crucial to understand what technologies and tools are available. With the right toolkit, it's now easier to track lead and customer data in detail, speak with priority accounts via the right channels; and importantly, personalise communication at scale. A CRM (Customer Relationship Management) platform. Central to effective marketing and sales alignment, a good CRM integrates with other platforms (such as your marketing automation platform) and enables both sides to track progress and insight in real time. A marketing automation platform - such as HubSpot. Think of a marketing automation platform as the central point, integrating all your marketing and sales activity and collating all interactions and touchpoints to provide complete marketing intelligence. Aligned with your CRM, automation platforms provide a central point to manage your campaign, from lead scoring, to tracking content, email campaigns and much more. A CMS (content management system). This again, must integrate with your marketing automation platform. ABM content promotion tools. Content Personalisation Platforms and Contextual Marketing tools allow you to use a mix of IP targeting, domain based targeting, geo fencing, keyword targeting and 3rd party cookie targeting to precisely segment content to exact accounts. Depending on your targeting approach, these tools can recognise when key accounts visit your site, where they are based geographically, keywords searched for etc, and use that insight to display personalised, relevant content to them. Social media. In an ABM campaign, it's important to promote the right content via the channels key accounts actively use. Social paid promotion can enable an extra level of targeting and relevant social engagement between your sales team and key account individuals. It will result in better nurture, relationship building and trust. Remember: for best campaign tracking and reporting, every tool and platform used in a campaign should integrate. Can Account-Based Marketing Tech be Used to Scale Campaigns? A range of ABM technology; an array of social listening tools, predictive data analytics, customer engagement data, 3rd party intent data, marketing automation and CRM technologies are available to help us scale activity. With them, we can gain deeper account level insight and profile stakeholders, gauge buyer propensity, identify the correct mix of media and channels to engage on and more. However, interpreting the data necessary to select ABM-ready accounts is another matter. Looking at the individual elements of ABM, activities such as developing an optimum and persuasive customer value proposition, developing account-specific messaging and bespoke content still rely on a considerable amount of human judgement, so keep in mind that ABM programmes can't be scaled by technology alone. Measuring metrics and reporting on account-based marketing programmes differs somewhat from more traditional strategies. As the focus is not on lead volume, but rather, on developing a relationship with a quality account; there are a range of other success criteria and metrics that account-based reporting will consider. Are your targets engaging with personalised content and online experiences? Are they attending your events such as webinars? Which of your content assets or site pages are they opening, digesting and viewing - and where in the buyer's journey do they sit? Website engagement, sales cycle length and velocity (conversion of prospects to opportunities and onward), revenue, retention, deal sizes (typically these are larger for ABM) and number of contacts per account are all additional metrics to monitor for success. ROI for ABM is also not as linear as traditional lead-volume-driven marketing. This is because the focus for ABM campaigns is largely to grow awareness, enhance mindshare and develop long term relationships with specific, high-value accounts. Considering if your target account(s), as a market of one, justifies the investment that ABM requires to generate a return on investment. Clearly defining your ABM account selection criteria; this is an important factor when determining potential ROI. Managing expectations by building the business case on a foundation of clear metrics and commercial KPIs. 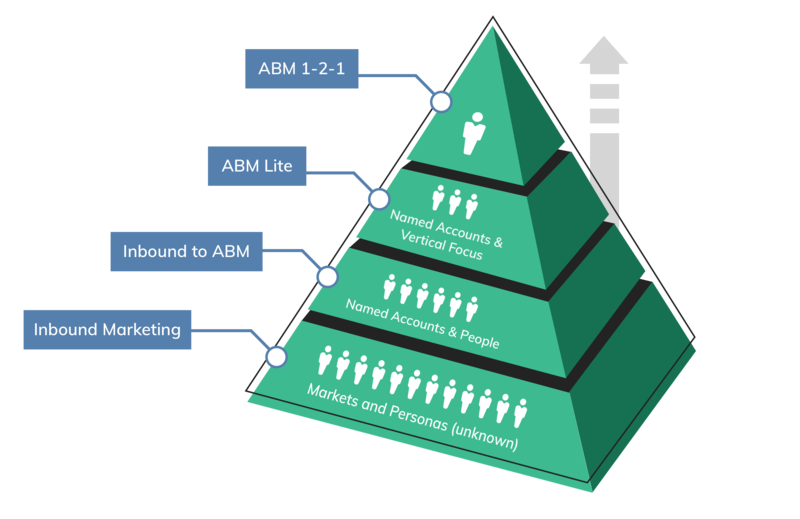 Are you already actioning a level of ABM? Or, are you conducting an inbound marketing strategy (which can be used as a foundation for quality lead gen and nurture and work as a pool to identify ABM opportunities)? How many accounts will the campaign focus on? Do you have a process in place to identify ABM opportunities - and are you aware of the resources required to create bespoke campaign assets for each? Does your expected target account spend justify 'market of one' ABM investment? Do you need to invest in marketing automation, a CRM, or other platforms and tools? Can you implement ABM activity in-house, or should you outsource to an experienced agency? Do you need to invest in your marketing team? Do you need to invest in your sales team? Have you accounted for the time and budget needed to plan, develop strategy, manage the campaign, create bespoke account-targeted content? What Does Success Look Like for ABM? Each ABM programme will have defined different success criteria, aligned with the overall goals of the business. For example, for one ABM campaign, success may mean increasing overall revenue growth, but for another, may be defined by an increase in engagement, or greater account perception of the organisation. Regularly monitoring key factors such as audience growth (especially growth of account specific contacts), customer perception, customer engagement, revenue growth, retention, and sales cycle length - and comparing these factors with non-ABM activity can all give an indication of ABM success. Learn how to precision-target the buyers interested in your services and explore everything from the basics, to best practice ABM campaigns. Ready To Book An ABM Planning Consultation? When starting or scaling ABM, it is important to have a comprehensive, actionable plan that is backed by data to help cement internal understanding and secure business buy-in.